Vicky Orb increase condition has been changed to only require Vicky, Maisie, or Rewde to be in the party at the start of combat. They no longer have to survive combat to get double orbs. ▼ Urgent Quest [Vicky's Training Grounds] appears! [Urgent] [Training Grounds] Invitation Tickets will be distributed at certain times of day when you log in. [Urgent] [Training Grounds] Invitation Tickets unlock the [Vicky's Training Grounds] quest for 15 minutes when used, where you can collect [Vicky Orbs] and [Limited] Branch Candy. If [Vicky] is in your party, you will receive double the [Limited] Branch Candy from drops. ▼ Three ★5 Employees appear! New employees [Rewde] and [Maisie] have increased appearance rates. ※ [Limited] Erde Forest Postbox and [Limited] Gold Postbox further increase their appearance rates. ※ During their increased appearance rates, [Rewde] and [Maisie] will appear at level 90. Quests that cost no bread. The first clear gives 3x [Vicky Orbs] as a reward. Read the story about Erde Forest's protagonists. Scenario Quests will unlock according to a schedule below. A quest that can only be cleared once per day. The first clear gives 1x [Vicky Orb] as a reward. Resets every day at 0:00. A quest where you can obtain [Vicky Orbs] as a rare drop. If any one of [Rewde], [Maisie], or [Vicky] are in your party when you sortie to the [Erde Forest], you will receive double the [Vicky Orbs] when they do drop. Has more battles than the regular Orb Quest, featuring high difficulty enemies. The harder routes have increased chances of dropping [Vicky Orbs]. ▼ Collect [Vicky Orbs] from Orb Quests! The Orb Quests have a chance to drop [Vicky Orbs]. [Vicky Orbs] can be used on the special event page's exchange shop to obtain Vicky related items. ▼ Obtain the ★5 Employee [Vicky] at the Exchange Shop! There is an Exchange Shop available on the special event page. The [Vicky Orbs] obtained can be exchanged here for [Vicky's Black Envelope] which guarantees the new ★5 Employee [Vicky]. Other Vicky related items such as the exclusive awakening item [Vicky's Awakening Book] and [Vicky's Exclusive Weapons and Armor], and other items used to power up Vicky can be found. ※ [Vicky]'s resume does not appear from normal draws. Be careful not to dismiss her as there is currently no other way to obtain her. During this event period, event missions will be available. Complete these missions to obtain various rewards. Used to exchange for various items in the event exchange shop. ※ Does not disappear after the event ends and may be used again if this exchange shop appears again. Delivers a resume from Maisie when used. Delivers a resume from Rewde when used. Delivers a resume from Vicky when used. Used to increase Awakening by 1 for certain employees. The shop will feature special sale sets for a limited time. ※ Can only be purchased using Paid Shinestones/Roidstones/Jobstones. Check your in-game mail every day for log-in bonuses! ※ There is a chance for this event to appear again in the future. If it does appear again, [Vicky Orbs] that you still own can be used again at that time. Three girls who live in the Erde Forest venture on a journey to explore Misterio-! 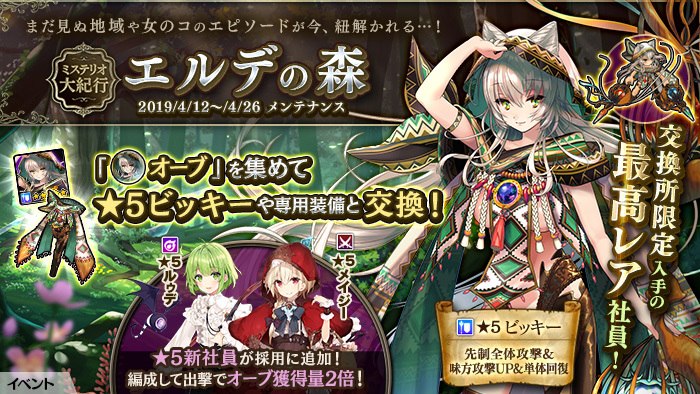 New Event [Great Misterio Journey Erde Forest] begins soon! [Erde Forest Retweet Campaign] begins! Enter this lottery to win the ★5 employees [Maisie] or [Rewde]! More RTs means more prizes! Follow the official account and retweet to enter! 3 out of 0 members found this post helpful. Last edited by Folseus; 04-19-2019 at 07:08 AM. While doing the harder maps I got confused by Elsa;s power. She's at +5 awakening yet she's pretty weak and seemingly fragile. Am I missing something here? @ofi123 The Hard maps recommended level is CU4 level 30. My max level CU4 Rose with best equipments were killed in 2~3 hits. You will need a really buff tank and strong party to farm it on Hard. I know it's hard. It's just compared to my other max CU characters who aren't max awakening, she's pretty lacking. Rose is definitely more like a front liner than Elsa. Elsa seems more like a buffed rogue in terms of strength and endurance, but lacks the double attack and utility rogue have which cause her to be in a weird place of not strong enough as a front liner and not having much supporting role either. Will the other two 5s stay in the draw after the event? I suspect something like costume girls or the ex 5s that cant be drawn anymore after their event. This greatly affects the incentive to get them with real cash or not. @kurayami1234 Those 2 are here to stay.